Write Now! 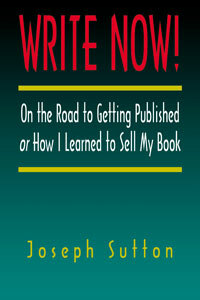 is a powerful little book about writing, getting published and selling your book. It’s about the urge to write, writing mentors, writer’s block, when to start to write and what to write. If you’re a writer or have an interest in writing, Write Now! will lead you into the writer’s life–to the life of rejection, questioning your writing abilities, wondering if you’ll ever get published and what to do when no one comes to your book reading. This book is not only the story of the making of a writer, it’s a book that will make you want to write. My publisher, Don Ellis, came into my life the day after my friend, Sky Diamond, passed away. Let me explain the connection. Sky Diamond was not only a good friend of mine, he was my chiropractor, confidant and a fervent admirer of my writing. I wish he could have lived to a ripe old age, but no, he died at the age of 57 of Hepatitis C on Wednesday, April 14, 1999. He was in the hospital a full month waiting for a liver transplant that never arrived. Years passed and I was back on my feet again. While at his office one day, Sky asked how I was doing. On a February day in 1999, two months before Sky would pass away, I received a postcard in the mail. It had to do with an event celebrating Jack Kerouac’s birthday. The card listed several people who were going to read passages from Kerouac’s works at the Black Cat restaurant in San Francisco’s North Beach District. A close friend of mine, George Kaye, was going to be one of the readers. I was reluctant to go because the price of admission was $10 (would Kerouac have approved of that? ), but since I was a great admirer of Kerouac and because George was going to read, I decided to attend. The night of the celebration took place on March 12, Kerouac’s birthday. I arrived at the Black Cat and went downstairs to the Blue Bar. The place was packed. I ordered a draft beer, found George, and sat with him before he excused himself to prepare for his reading. All the readers—Don Ellis being one of them—read a passage from their favorite Kerouac novel. They all did a fine job of conveying that special Kerouac style. It was interesting to hear Kerouac’s words again because he was a tremendous influence on me when I began my writing career back in 1969. I wanted to write just like him: swift, jazzy, no holds barred. At times I did write like him, but I was imitating him. What I needed to do was to acquire my own style, my own view of the world, for that’s what Kerouac alluded to in all his writings—Don’t imitate, be yourself completely. After the reading (a huge success, by the way), I noticed Don Ellis sitting at a table with three other people. I knew of Ellis. I’d sent two manuscripts to his publishing house over the years and both were rejected. Ellis went into a spiel about a writer and publisher becoming co-publishers. In other words, he was telling me I would have to pay half the publishing cost if he liked my book. I closed my ears to this and thought, I’m a writer, not a co-publisher. It’s against my principles to fork over money to get my book published. Why is he telling me this? Sky Diamond and I attended Fairfax High School in Los Angeles in the mid to late fifties. In 1984 I reconnected with him, thanks to a mutual friend of ours who told me to call him about my asthma. I was teaching at McAteer High School in San Francisco at the time. McAteer was built like a fortress—not a window in the whole school. Everyone was breathing recycled air. And if that wasn’t enough, I had to teach five classes in five different classrooms five days a week. Given these circumstances, plus the usual stress and strain of teaching 14- and 15-year-olds, my resistance fell to a rock bottom low and I contracted asthma. I called Sky and asked if he could treat this disease that prevented me from getting air into my lungs. He gave me a logical explanation how he could, and so I soon started seeing him on a regular basis. Besides giving me back adjustments, Sky told me to eat more fruit and vegetables, less meat and to cut out all dairy products from my diet. He also told me to exercise daily. After following this regimen religiously for seven months, I was cured of asthma. If Sky could cure asthma, he could cure anything. He didn’t just crack my back and bid me farewell when I was at his office, he took his time and talked to me. He was always there for me, asking questions, listening, advising, giving 100% of himself. It was this personal touch, this concern on his part that helped cure the many aches and agonies in the fifteen years I saw him. The man was a true healer of “dis-ease,” as he used to pronounce the word. Someone once wrote, “We can better appreciate the miracle of a sunrise if we have waited in darkness.” I now know exactly what that adage means. As a writer I had been waiting in darkness for three decades. My miracle of a sunrise came in the late afternoon on Thursday, April 15, 1999, the day after Sky Diamond passed away, when Don Ellis of Creative Arts Book Company called and said he wanted to publish Morning Pages. I’d been published before—fifteen stories, even a book of health quotations I compiled—but no one ever took a chance on publishing a book of my fiction until Don Ellis entered my life. No more darkness. No more depression. No more doubts about my writing ability. No more dreaming against all odds of getting a book of my fiction published. Don’s acceptance of my book was as thrilling as witnessing the birth of my son or marrying my wife or scoring two touchdowns against the University of Washington. I was floating in heaven for three months. When a great friend, healer and supporter left his mortal coil and passed out of my life, the very next day my publisher and now good friend came into my life. You’re probably asking yourself, “So what’s the big deal about this connection between your chiropractor and publisher?” My answer to that is: Sky Diamond and Don Ellis were born on the same day in the same year: August 6, 1941.